Jungle curry is Thai curry made without coconut milk, and this flavour-packed recipe is sure to appeal to lovers of hot, spicy food. Vegetarian red curry paste is available from most supermarkets, or can be made by combining equal quantities of dried red chillies, coriander seeds, galangal, lemongrass, garlic, shallots, and kaffir lime peel. Substitute any Thai vegetables you like, and add tofu if you wish – as long as you keep to the basic quantities, the recipe is pretty flexible. Serves 2. 1. Heat the oil, and fry the curry paste for a couple of minutes. 2. Add the ginger and vegetable stock, then stir for a couple more minutes. 3. Add the remaining ingredients, and cook, stirring occasionally, until the vegetables are al dente. 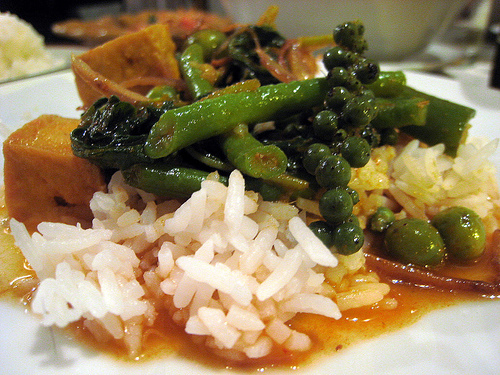 Serve with plain or coconut rice and a tofu dish.